Nicole's Needlework: Episode 19 - Lots of Finishes! Episode 19 - Lots of Finishes! 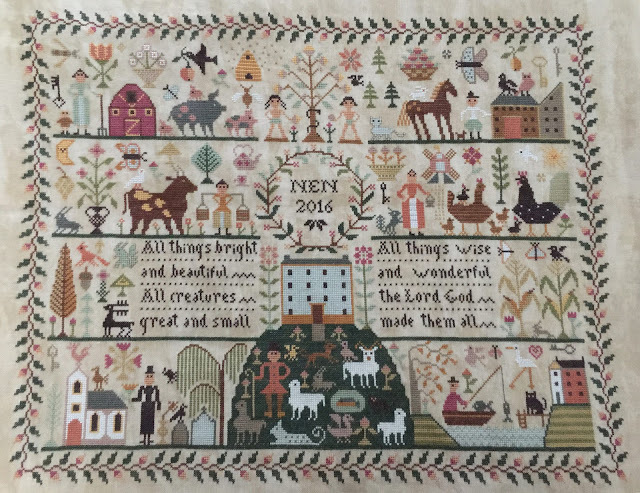 All Creatures Great and Small by Barbara Ana Designs - 40 ct. Vintage Country Mocha by Zweigart and Anchor Threads (1 over 2). Goodness and Grace by Shepherd's Bush - 32 ct. Stepping Stone by R&R Reproductions and various silk and cotton threads (1 over 2). Sampler Hill by With Thy Needle & Thread - 40 ct. Vintage Pecan Butter by Lakeside Linens and various cotton threads (1 over 2). Morning Yearning Shawl by Sarah Rose - Madelinetosh Tosh Merino Light "Vermillion." Blueberry Waffle Socks by Sandy Turner using Hedgehog Fibres Sock "Teacup." Anniversaries of the Heart by Blackbird Designs - 40 ct. Vintage Meadow Rue by Lakeside Linens and various cotton threads (1 over 2). Thanks Karen! Yep, I need to start saving now! Yes, I would go on Facebook and search Stitch Maynia. They have a ton of people who could possibly do this for you. Good luck! Love your pieces-I watched several flosstube videos of yours this past weekend. I am so glad to see you back to your stitching! You were such an inspiration for me when I read your blog! Love your finishes! I also stated ACGS and it was so much fun finishing each motif! It went fast and kept my interest. Can't wait to see yours framed. I want to finish SP Halloween sampler. I have two with threads so if you know someone who needs chart and ltd. edition threads, please have them contact me or you can send me their email address. It is a great one! Love your knitting too! Thanks for sharing your work! Thanks Pam!! If someone contacts me about the chart, I will definitely let them know! Happy belated birthday. I'm getting caught up on all your videos. So many gorgeous samplers that need to be gracing your walls. I have started using 1 strand over 2 for all my new stitch projects, even as low as count 28. I love the look. The stitches lay so nice and are perfectly defined. Thank you for sharing your thoughts with lovers of this needle work. Thank you Myra! Yes, I love 1 over 2. It makes stitching so easy! Lovely finishes and ❤️ With thy needle and thread too.Looking forward to your next podcast. Thank you Selda! I don't really notice too much of a difference in quality between Anchor and DMC. I just wanted the colors to look as close as possible to the finished picture. Enjoy watching your videos. Do you know if the Jenny Bean Halloween Sampler pattern is still available in the shops? I would like to find it.